Did you get your workout in today? I'm not going to lie, I feel like I've fallen off the workout wagon until very recently. I use to have my workouts three times a week religiously (four on a good week) and now maybe three times a month. I know that life gets busy but my husband and I have promised to motivate each other and start to be active again. As I told you guys (here) I partnered up with Old Navy on a three-part collaboration. 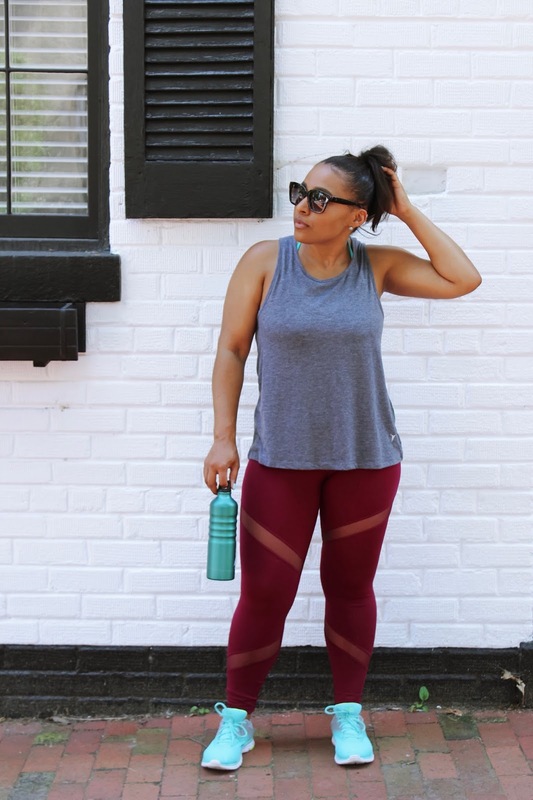 For this second look, I chose an activewear look to share with you guys. I must say pretty gym clothes definitely put me in a workout mood right away. It's crazy that the clothes we wear influence our behavior and the way we think! When I first got into the fitness world I use to throw on a big t-shirt and some old spandex. Now? I take my workout clothes seriously lol and not just because I'm a fashion blogger but because when I wear cute workout clothes it instantly motivates me. I'm totally in love with these mesh burgundy spandex. They are so chic and super comfortable for running. Old Navy has an amazing selection of activewear. I was so undecided on which spandex to get; I mean, check out all of these selections. The floral sports bra fits perfect and offered great support. I especially love the details on the back! How do you guys dress to workout? 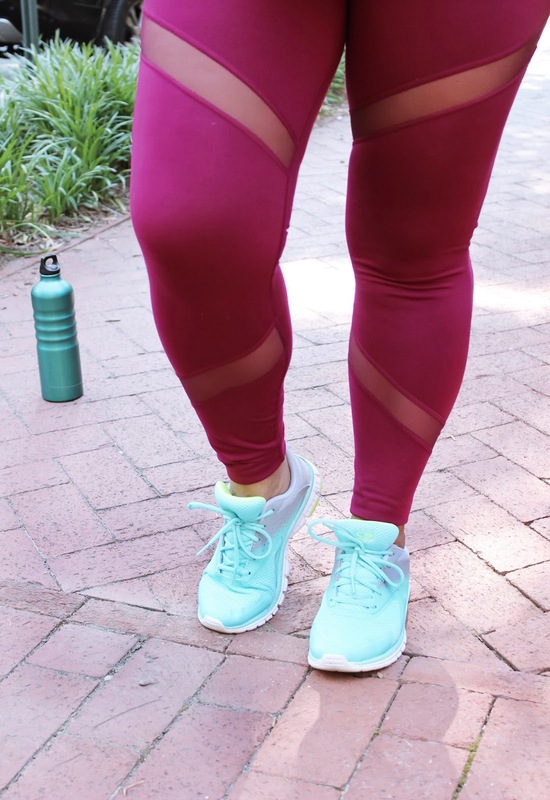 Do you feel cute workout clothes help get you in a workout mood? This app is like a workout diary of your day. Once you input in your fitness goal, the app tracks everything you eat and it is divided into breakfast, lunch, dinner, and snacks. It tells you how many calories you have left to consume in that day and it also tells you how many calories you are consuming. It also logs in your exercise and steps for the day. This app gives you workout ideas ranging from yoga to a full body workout. I love this app because sometimes I get stuck doing the same workouts and it's always good to switch things up. The app times you while you're exercising and also counts the calories you burn from the workout if followed properly. I've had this one for the longest and I love using it when I'm jogging through my community, running on my treadmill, or running on a track field. It times your run and counts your calories. You can invite friends so you can motivate each other and the app gives you challenges to beat. Hope you enjoyed this active look! Thank you for visiting my Kloset! Look out for my third and final look with Old Navy. Follow along on Instagram for the #OldNavyStyle fun with the hashtag #SayHi. Niña pero tu ya estás lista para la playa! Que cuerpazo el que te manejas! Y sin lugar a dudas la ropa que usas para el entrenamiento motiva a no tirar la toalla. Me encanta todo lo que llevas! I am telling you the best solution for getting the best bodybuilding product from the online market where we always have the fear of getting the fake and bad quality product from the dealer. This worldfitnesscr.com/ online shop will give us the 100% quality body building product which is good for us and our bodybuilding works. I really liked your workout attire. It’s really looks fabulous. Want to try something best for my workout exercise too. Have heard from a friend that a reputed online store is selling carbon 38 workout clothes on good discount. Will avail services from that store soon. The cabbage soup diet paves the way for people who want to lose around ten pounds in a week.
. Throughout the years yes I have at some time attempted all the abovementioned however I have never stopped practicing all together. I have constantly discovered what works for me at various focuses in my life. Therefore, you can have many different types of recovery workouts,Russell Westbrook Workout Supplements depending on the situation. I previously stated that recovery workouts can also be regularly scheduled into your workout plan, but explaining that would involve discussing all the specifics in an entire workout plan, so for now I will focus on explaining how to add recovery workouts to your existing exercise program.